Be Part of a Great Society and at the Forefront of Product Innovation! Why be a Member of the IEEE, and Why Join the Product Safety Engineering Society (PSES) of the IEEE? A boy asked once a wise man, "Is the butterfly I am holding in the palm of my hand alive or dead?" If the wise man said "alive" the boy would crush the butterfly and show it dead, but if the wise man said "dead," the boy would laugh and let the butterfly fly away. The wise man was cleaver enough not to offer either of the those replies, instead answering the boy, "As you will, my lad, as you will." Whenever I am asked, "What is the advantage of IEEE membership?" I believe the wisest reply would be similar: "As you will, my friend, as you will." In my many years of IEEE membership and professional career, spanning decades, I have learned that the benefits of belonging to any professional society, and for that matter-to any social group or association, vary from person to person. Mostly, the efforts an individual puts into a society are multiplied ten-fold in the benefits that person enjoys. Therefore, the value of the "membership benefits" is really determined by the individual member's values, needs, and, particularly, his personal involvement. The IEEE is a diverse organization, encompassing more than 374,000 members active in almost 40 technical societies. Therefore the interests of our members are projected in a wide variety of technical issues and professional concerns that provide value to each member. In a presentation made during the Membership Development Retreat, which took place in April 2005, New Brunswick, NJ, USA, the reasons for joining and the reasons of members for continuing their membership in the IEEE were presented (see Figure 1). 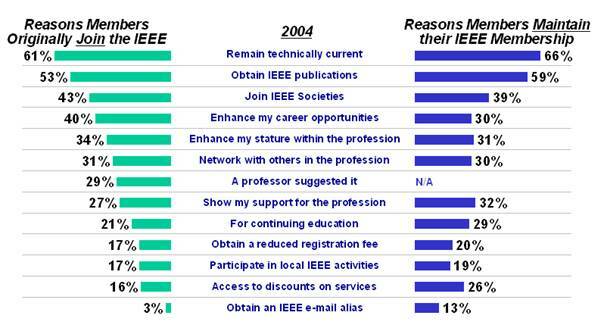 Interestingly, "traditional" financial benefits are no longer the driving factor for IEEE membership. Easy access to IEEE technical publications (the IEEE publishes a major portion of all technical publications worldwide), which used to be a traditional reason for membership, still constitutes a major, yet not the leading motivation for belonging to the IEEE. This should be of no surprise since in our digital age the IEEE digital libraries have become easily accessible to all at low cost through libraries in the universities and in the industry. From Figure 1 it is evident that the key words are networking and professional advancement. Those include the ability to stay current in one's profession and be competitive in the field, to network with colleagues and professionals, and to find career opportunities. It should be clear to each IEEE member that his or her personal advantages lie in their active professional involvement, development, and growth with outstanding opportunities for career satisfaction. Involvement can take many forms, and along the way you will build a worldwide community of colleagues with similar interests. Attending one or more of the 300 annual IEEE major conferences or 3000 IEEE major seminars, workshops and tutorials around the globe will no doubt keep you current in your profession. IEEE members also plan and organize conferences in their community-a rewarding experience of its own merit. In those conferences (which, by the way, you attend at a reduced rate as an IEEE member), not only will you have the opportunity to broaden your professional knowledge, but you will also have the opportunity to meet and interact directly with the leaders, the true "cedars of Lebanon" in your field, who are always open to the fellow attendees, novices and experienced alike. Such meetings allow you to share your opinion and insight, and help spur new ideas. Involvement in IEEE standardization activities, through one or more of the working groups sponsored by your society, is also a superb way to obtain the latest information in your field and allows you to influence the development of future standards. Currently, more than 15,000 IEEE members are involved in the work of hundreds of such working groups with topics ranging from radiation hazard safety to nanotechnology. As a result, many well-known IEEE standards are globally utilized, the most renowned probably being the IEEE 802.11 LAN standard. Imagine-you can personally contribute to the development of such standards! Would that not be a reward of its own merit? Your local IEEE Section or Chapter will welcome and encourage your involvement in its activities, whether you want to actively serve on one of its committees, help in organizing a technical or social event, or mentor a promising young engineer or student. Even simply participating in regional and local activities (e.g. chapter meetings), offers an outstanding chance to exchange professional opinions. In those meetings, you will meet IEEE distinguished lecturers and other knowledgeable speakers from academia and industry who present high quality professional talks, socialize in a relaxed and friendly environment, and even make a presentation of your own. You would not believe how a successful presentation satisfies the speaker himself. All of the above activities will help in enhancing your career because through them you acquire vital skills that are not taught in the classroom but are essential for your professional advancement. These skills include leadership, finance, project planning and communications. Often, this will be your first opportunity to experience them. While you are at that, you will also gain access to individuals at all tiers of the profession and become a more valuable asset to yourself, your associates and your employer. Many IEEE members who began their IEEE career in the local activities have found their way to leadership positions, in their professional societies and in their personal careers. But remember, as stated at the beginning of this article, the advantages you gain from your IEEE membership are "as you willâ€¦"
The benefits you may obtain from your membership will most probably vary along the different stages of your professional career, and hence you may find that the IEEE membership advantages encompass a wide variety of services that may not all seem to you of importance to you at first glance. Many of those benefits may be found on-line. The most recent of all is the MyIEEE members-only portal customized to your own interests and needs. As an IEEE member you are entitled to your personalized your_name@ieee.org portable IEEE e-mail alias, providing you, free of charge, high-level computer security services including anti-virus and anti-spam protection. You will also gain access to more than 80 "virtual communities" dealing with technical and career issues, as well as to on-line continued education training programs available by several IEEE societies and educational partners. But above all, there is one overarching member benefit-the respect and competitive edge associated with your belonging to a high-quality professional organization. Your access to the IEEE information resources and your affiliation with other members underscore the worldwide renown the IEEE enjoys for its vision, its leadership and its innovation spanning more than a century. Advantages of Society Membership: Focus Your Career! IEEE membership is only the first and fundamental step in your profession. As a practitioner in your particular field, you should focus your career on those aspects which directly contribute to your technical interest. Society membership is the key! Society membership enhances the benefits you receive as an IEEE member, tailored to your discipline. Through your Society, you will enjoy networking opportunities without equal, providing you with direct access to innovators and practitioners around the world-people you may have never otherwise met in the course of your daily practice. Through the Society's activities, conferences, workshops and local chapter meetings, you will meet the top minds in your field "on the level" and broaden the support structure you need to succeed in your career development. Your Society is, first and foremost, a source of information and professional know-how. This is where we learn our trade! Society technical and standards committees, which are open to all members regardless of their experience and expertise, deal with the evolution of new aspects of technology by helping document their characteristics and spread the information through education and training within the technical community. Through active participation in Technical and Standards Committees, not only will you be able to contribute to the evolution and advancement of your profession, but also of your own professional skills. Furthermore, those committees provide you easy access to the technical experts within the Society. These experts are often glad to provide guidance and consultation for individual questions. Seek them out when you need assistance. The Society is also a place for professional education and advancement. In the Society you will find members who provide education and instruction in the elements of the Society's technology. As a member of the society you will learn who these valuable resources are and how to contact them. And of course, the Society membership may create job opportunities. It enables you to become acquainted with other colleagues working in your field or related fields. This acquaintance may provide early information on new job opportunities as the industry grows and changes. It will also provide you with valuable insight when openings become available within your own organization that would be a good fit for someone you have met and whose skills you have come to know through the Society activities. In summary, Society membership offers many opportunities to volunteer and grow. Whether you volunteer to serve on technical or standard committees, edit a journal, or get involved in other ways, the experience you gain puts you on the career path for continued success in your particular discipline. Safety is everywhere! Any product, from the smallest electrical toy to the largest of electrical machines, must comply with applicable product safety requirements, whether by law or for the manufacturer to minimize liability. Systems carrying out critical missions may also require that functional safety aspects be addressed in their design and testing. In recognition of the importance of product safety engineering, on the one hand, and its unique interdisciplinary nature on the other, the IEEE approved the founding of the Product Safety Engineering Society (PSES) in 2004, making it one of the youngest professional societies of the IEEE. Consistent with its goals and charter, the PSES addresses the theory, design, development, and implementation of product safety engineering for equipment and devices used in the scientific, engineering, industrial, commercial and residential arenas. The Society provides a forum for product safety professionals and design engineers to discuss and disseminate technical information, to enhance personal product safety skills, and to provide product safety outreach to engineers, students and others with an interest in the field. It also serves as a platform cooperative activities, both internal and external to IEEE, such as the promotion and coordination of product safety activities among IEEE entities. What does the PSES offer its Members? As a member of this unique group of product safety professionals, you become part of a professional community offering you multiple personal, career, and business benefits. First and foremost, you have opportunities to network with technical experts in your field of interest. Conferences, workshops, and local chapters, as well as on-line services, provide you with numerous opportunities to work alongside the industry's top experts. First and foremost, the PSES provides a forum for addressing product safety engineering as an applied science, through networking with your peers and colleagues, as well as for your personal education and career professional development. Product safety engineering is multidisciplinary, and as such, requires networking and interfacing with professionals across a broad spectrum of associated disciplines (e.g. EMC, reliability, power engineering, to list a few). This is best achieved through cooperative coordination of product safety engineering activities with other IEEE Societies and non-IEEE professional societies and organizations. The PSES also provides a platform for outreach to interested engineers, students and professionals who may not be product safety engineers per se' but may be closely interfacing with product safety engineering and related disciplines. As it is an interdisciplinary field, members of PSES can greatly benefit from these outreach and networking opportunities. In particular, members of the PSES receive discounted dues available for Society members only at UL University seminars, where you have the opportunity to enhance and broaden your knowledge in product safety. You may also receive special member-only discounts when registering to the International Product Safety News. The PSES sponsors the IEEE International Symposium on Product Safety and Compliance Engineering, giving you the opportunity to be part of the latest developments in your field and network with leaders. The Symposia feature technical papers on current product safety engineering topics, a series of progressive educational tutorials, and workshops designed to introduce those new to product safety and compliance engineering to the technical aspects of the discipline, and technical exhibits presenting a variety of product safety and compliance hardware, software, and design and test services. In addition the PSES cooperates and co-sponsors a number of related conferences worldwide. You can attend the PSES symposia at a member's reduced rate. This quarterly on-line PSES Newsletter is available for PSES members only, and helps keep you abreast of technical, professional and membership activities within the society. The Newsletter provides current information on professional events, Society developments, product information, local activities and full text technical articles. Whenever you look for information on what is happening in the PSE Society, the Newsletter is the place to find it. The IEEE PSES sponsors a number of awards to recognize the efforts of its volunteers who have made significant contributions to the society and/or the product safety engineering profession. Each year, awards ranging from certificates of appreciation for outstanding service to the Society, whether at the local chapter or the society level and local activities, up to awards for outstanding technical achievements in the field of PSE, serve as a token of appreciation and recognition by peers. The PSE Society awards are proudly presented and displayed by the members, and well recognized by their employers. Much of the work of the PSES takes place locally in our chapters worldwide. A listing of the chapters and their chairpersons may be found on the web site. The chapters provide a local center for product safety engineering activities by hosting presentation meetings, workshops, tutorials, colloquia, and social gatherings. I strongly encourage you to contact your local Chapter Chair, and find out how you can participate. If no chapter exists in your local area, why not consider starting one? All professional activities of the PSES are performed by volunteers who are members like you, mostly in our Board of Governors and the Society's Technical Committees (TCs). Meetings of the Technical Committees and the Education Committee take place in central locations, via teleconference calls, electronic communications, and through e-mail discussions. Distance is no longer a constraint in joining and benefiting from any of those activities. Surely you can find interest in one or more of them. In close ties with the EMC Society, those committees play an important role in the overall success of the PSE Society by promoting activities in their fields and providing expert knowledge and assistance to generate and review technical papers, organize and operate sessions at symposia, develop standards, and evaluate "state of the art" technology and EMI control measures. These committees and their meetings are open to all members, the expert and the novice alike. Whether you come to contribute from your knowledge and experience, or to learn from the experience of others you are welcome! You can find information about each of the committees on the PSE Society web site by clicking on the "Committees" button in the side bar and following the associated links. You are encouraged to investigate each of the committees listed there and to contact the chairman of any that interest you for a further explanation of the committee, its functions and options to participate in their activities. Of course, the PSES Chapter in your area will always be glad to have you as an active member. You can give a talk, or actively participate in a discussion following a talk by others. If there is no chapter in your area, maybe you could start one yourself. You will receive all the support you need, and will find out how rewarding this can be. And finally, you may wish to join the governance of the Society: You can "run" for a position on the Board of Governors of the PSES Society. The way is open to ANY member of the Society. Who knows, one day you may even be the President of the PSES Society. "The achievement of your goal is assured the moment you commit yourself." In every stage of your professional career, explore your IEEE, and PSES Society membership opportunities, make the best of it for your career advancement, and use it both for your advancement and/or making the world a better place to live in. For more information, please visit the IEEE PSES web site at: www.ieee-pses.org. You can also write personally to Jim Bacher, the President of the PSES, at: . You WILL receive a reply! Guaranteed! Hope to see you among our active members! Remember-to the question, "What is the advantage of IEEE PSES membership?" I reply, "As you will, my friend, as you will." Elya B. Joffe, is a member of the Board of Governors, IEEE Product Safety Engineering Society.